Landing Point Isle is a tiny series of sandy islands in the northern part of the Irenic Ocean. It was once a busy hub of activity between the years 2003 and 2005 as it was a "landing point" for many new residents seeking residency and citizenship in SW City. Small boats carrying passengers (mostly Offlanders and Outlanders) would sail in from the northern shores of the Outerlands to this isle to allow them to wait and make the rest of the journey to SW Island via Palm Sea Ferry or HyperGate?. 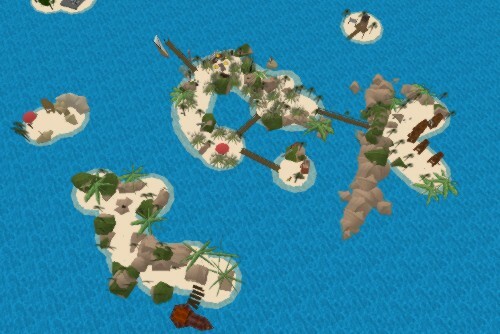 With the construction of Flint Memorial Bridge, which physically connects the Outerlands to Sybit Island, the small boats no longer make their routes to this island, making it nearly deserted. Due to the desertion, the island has grown over with thick shrubbery and has become quite run-down. Palm Sea Ferry has even stated some interest in stopping their ferry service to this island. Landing Point Isle, although very remote and hard to reach, can just barely be seen on the horizon from some of the higher points on the nearby Dratisi Island.